Jamie McMurray will wind down his 17-year NASCAR Cup Series career in February of 2019 at the Daytona International AdventHealth Speedweeks. Once he finished the 61st running of the Daytona 500, McMurray is scheduled to hang up his racing suit, for a dress suit as he joins the NASCAR on FOX team as an analyst. McMurray exploded onto the NASCAR scene in 2002, scoring a win in his second-career Cup Series start while substituting for the injured Sterling Marlin at Charlotte. The former world karting champion worked his way up through the Truck Series and XFINITY Series ranks before signing with Chip Ganassi Racing, where he ran his first full Cup season in 2003, winning the Rookie of the Year Award. After a stint at Roush Fenway Racing from 2006 to 2009, McMurray returned to Ganassi where he turned in a monster 2010 campaign, winning both the Daytona 500 and the Brickyard 400 in the same year. 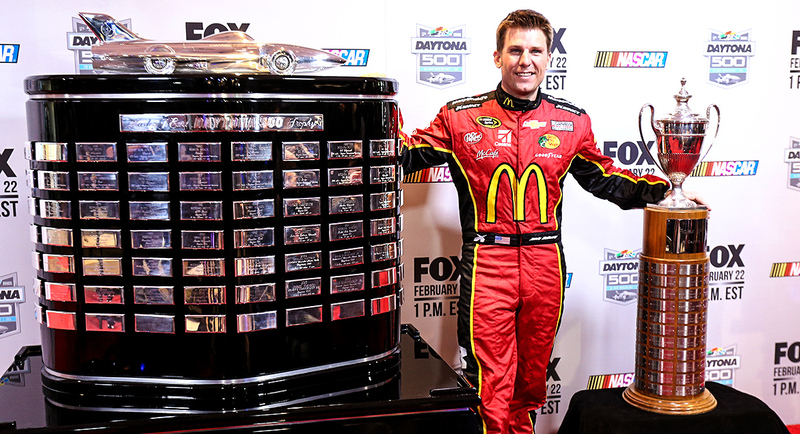 During his second act at Chip Ganassi Racing, McMurray also scored a win in the 2014 NASCAR All-Star Race, as well as won the 2015 Rolex 24 at Daytona along with CGR teammates Scott Dixon, Tony Kanaan and Kyle Larson. He also made the NASCAR Cup Series playoffs three consecutive years from 2015 to 2017. Outside of the car, McMurray focuses on fitness and nutrition and competes in grueling endurance events both running and cycling. He completed his first marathon in December of 2017 with a time of 3:25:14, and backed that up in 2018 with a time of 3:14:06. His charity, the Jamie McMurray Foundation, has donated over $225,000 to Autism Speaks and other children’s charities. His final full-time season as driver of the No. 1 Chevrolet for Chip Ganassi Racing, McMurray’s season was highlighted by a runner-up finish in the inaugural ROVAL race at Charlotte Motor Speedway. Turned in one of the most consistent seasons of his career with 17 top-10 finishes and qualified for the NASCAR Cup Series playoffs for the third straight year. Made the NASCAR Cup Series playoffs for the second consecutive year. Also made his 500th career Cup start. Rolex 24 Hours of Daytona race winner. Made the NASCAR Cup Series playoffs. Sprint All-Star Race winner. Earned two poles, seven Top 5 and 13 Top 10 finishes. McMurray captured his first NASCAR Sprint Cup Series win at Charlotte Motor Speedway while filling in for Sterling Marlin. He also ran a full-time NASCAR Nationwide Series schedule where he brought back two wins, six top-five, and 14 top-ten finishes. This performance brought him home 6th in the NASCAR Nationwide Series standings.